"Flying saucers" entered the mainstream in 1947. Initially perceived as an American passing fad newspapers in Australia picked up on the controversy. It wasn't long before locals were reporting their own "saucer" sightings. There were many reports before 1947 but it was this wide public manifestation and reporting that ushered in the "flying saucer" era which in turn would be recognised and defined as the UFO phenomenon. My web site http://www.theozfiles.com/ documents some of the Australian pre 1947 sightings along with a few 1947 reports.An example of the Australian reporting of the period can be seen in the front page of the Sydney afternoon newspaper "The Sun" of July 8 1947 - "39 STATES SEE 'SAUCERS', MYSTERY DEEPENS, FANTASTIC THEORIES, 6 Claim They Saw "Saucers" Over Sydney, "Illusions," Claims Psychologist." 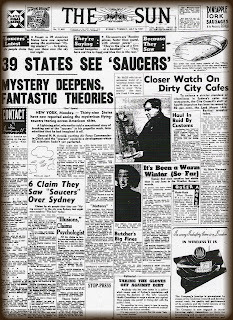 Other Sydney newspaper coverage at the time included the following headlines: "First 'Saucer' Found Was A Balloon" (a reference to the Roswell story - The Sun, July 9), "MORE 'FLYING SAUCERS' REPORTED IN U.S." (Daily Mirror July 7), "TWO "FLYING SAUCERS" SEEN TO LAND IN U.S., Searchers Fail To Find Any Traces, Phenomena Seen By Sydney People." (Daily Mirror, July 8), (and in a measure of how quickly the treatment changed) "SAUCERS BEGINNING TO MAKE FOR SHELVES, Back-To-EARTH Flight Route, Festival For the Screwballs." (Daily Mirror, July 9) Inside the Mirror reported "FLYING SAUCER" GROUNDED ON RANCH Handed Over to U.S. Army DETAILS OF DISC KEPT SECRET. SKY GAZERS GOT IT IN THE NECK (this story announced "Sydney people have given up gazing into the heavens after "flying saucers") , The Sydney Daily Telegraph newspaper reported a similar evolution in reporting: "FLYING SAUCERS" REPORTED IN AMERICAN SKIES (July 7), "AMERICAN PLANES PATROL FOR "FLYING SAUCERS" (July 8), "It Was Only A Storm In A Saucer U.S.A. NOW LAUGHS AT DISC "Flights Of Fancy" (July 9), "Flying Saucers" Queer Tales Told By "Observers" (July 9). Sydney's "newspaper of record" - the Sydney Morning Herald chimed in with stories like "Students At Sydney University See "Flying Saucers"; Professor F..S. Cotton's Theory" (July 8) and "Sydney People Still Say They're Seeing "Flying Saucers" (July 9).It was a pretty tough gauntlet that any "saucer" spotter would have to run. The media treatment ensured that the UFO phenomenon's manifestations would remain largely marginalised and somewhat hidden. For Australia at least it would take a rash of sightings in 1950 to give a more substantial public launch for the UFO mystery down under. These included the sightings of Fred Bepps in Geelong Victoria during June 1950 and Alex Holland near Avoca Victoria in July 1950. There was of course evidence of earlier cursory interest by the military. Among the earliest of the still extant sighting reports in the Directorate of Air Force Intelligence (DAFI) files was a nocturnal light account at Bass Point, NSW, on July 16, 1950. The growing number of reports that involved official agencies and highly regarded sources served to heightened official interest, initially from two quarters, namely the Royal Australian Air Force (RAAF) and the Department of Civil Aviation (DCA). The following report is striking not only because of the contents but also because of the calibre of the witness. Just one day earlier, the Minister for Air, William McMahon (a future Australian Prime Minister) had stated in parliament that the “flying saucer” reports were “probably based on flights of imagination”. Flight Lieutenant William Scott, the chief test pilot for the Government Aircraft Factories, was not given to “flights of imagination” and yet at approximately 1200 hours on August 14th, 1952, while flying in a Vampire aircraft, between 35,000 and 36,000 feet, near Rockhampton, Queensland, he observed something he could not explain. Looking east, towards the coast, Scott saw a large circular light at a lower elevation which could not be estimated due to bad ground haze. The light was the colour of an ordinary incandescent light globe. After approximately one minute a number of small lights (6 to 10) appeared to come from the main light. The smaller lights appeared to surround the bright light for about 2 minutes before disappearing. After a further 2 minutes the big light also disappeared. That report did not become public knowledge. It may have been embarassing for the Minister if it had. The report remained classified until I found it in DCA UFO files I was permitted to examine at the offices of the Bureau of Air Safety Investigations during November, 1982. 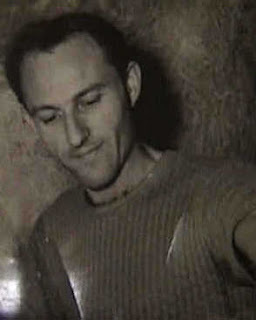 The first major sighting wave of real significance occurred in May, 1953, with the “Mackay Incident” as its cornerstone. On May 10th, the crew of an ANA DC3 aircraft observed “a strange object like a lighted glass dome” manoeuvring around them for some 5 minutes. The UFO was also observed from the ground by Mackay airport personnel. Despite the delayed and tentative beginnings the UFO controversy in Australia is an extraordinary manifestation of a global phenomenon with many rich and potent expressions with numerous breakthrough cases and developments emerging from down under. Excellent examples can be found within the pages of the Ufologist magazine and in the published record of Australian groups and researchers. You can also find some on my web site (at the link given above) and in my books "The OZ Files - the Australian UFO Story" (1996) and "Hair of the Alien" (2005) (the latter focuses on the alien DNA paradigm strikingly revealed in the DNA study of the biological evidence involved in the Peter Khoury abduction milieu - a case study from Sydney Australia).